View More In Lights & Reflectors. Imported high brightness LED red chip up to 120 lumens, low power consumption, long service life, high visibility up to 200 meter visible. Bulit in high quality rechargeable lithium battery, using the most convenient USB charging mode, only takes about 2 hours to fully charge. Simple control button, Conveniently located on top of the light for easy access. Can be use as a Bicycle Helmet Light, Mountain Bike Rear Light, Road Bicycle Tail Lights, Kid's Bike Safety Light and More. Notice: please press for about 4s to turn it on. ✔ SUPER BRIGHT SAFE CYCLING LIGHT: 180 degree wide angle visual design and high visibility up to 200 meter visible ensure your safe riding. Imported high brightness LED chip up to 120 lumens, low power consumption, long service life make it very worthy to have one of this bicycle taillight. ✔ USB RECHARGEABLE LIGHT: NEVER waste money on batteries again. 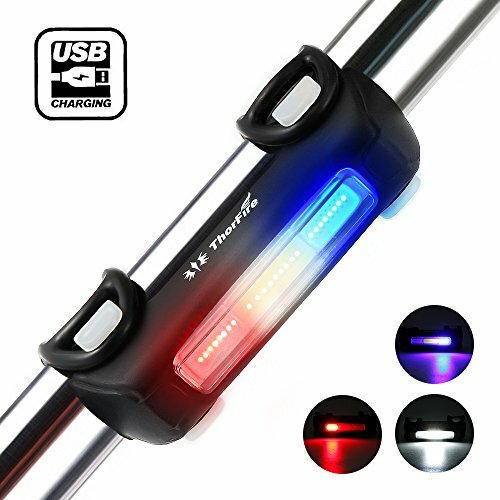 All you have to do is connect the included USB cable to any standard port on your smartphone, power bank or computer to charge up this rear bike light. ✔ EASY TO INSTALL & Multi-Functions BIKE LIGHTS: Quick mount without any tool, quick release rubber strap ideal for handle bar/ seatspot mount ( fits 22-31.8mm). It's a Multi-purpose light, can be used as a bicycle helmet light, mountain bike rear light, road bike lights, kid's bike safety light or any other use that you can imagine. ✔ WHAT YOU GET: 1x USB rechargeable rear bicycle light, 2 x Rubber Strap, 1x USB Charging Cable, 1x User Manual. ThorFire's 40 days money back guarantee, 18 months hassle-free warranty with considerate customer service. Notice: please long press for about 4s to turn it on. If you have any questions about this product by Thorfire, contact us by completing and submitting the form below. If you are looking for a specif part number, please include it with your message.